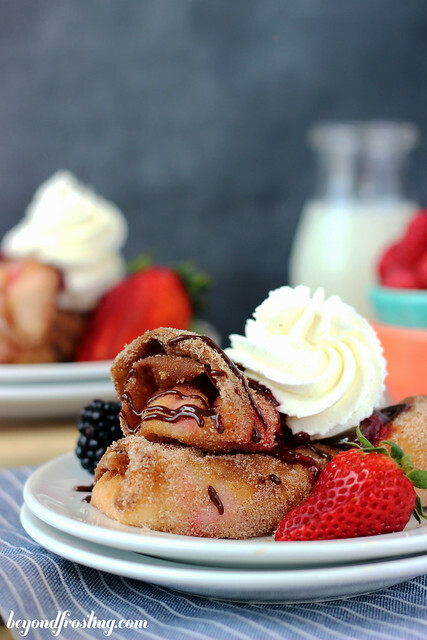 When the deep fryer comes out, all the things get fried! Seriously, it’s like a marathon of frying. 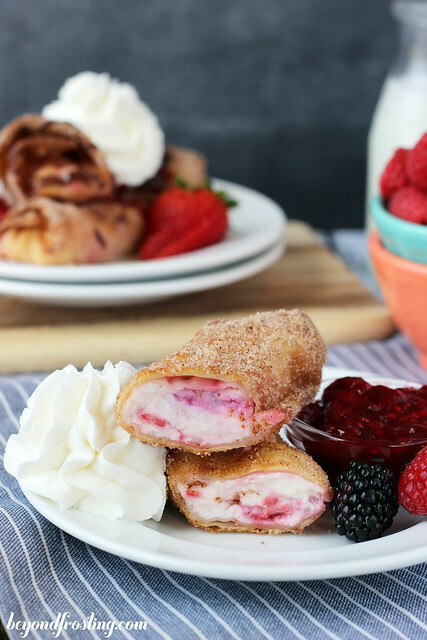 So before we could enjoy our chicken fingers this weekend, I had to make these Raspberry Cheesecake Egg Rolls. 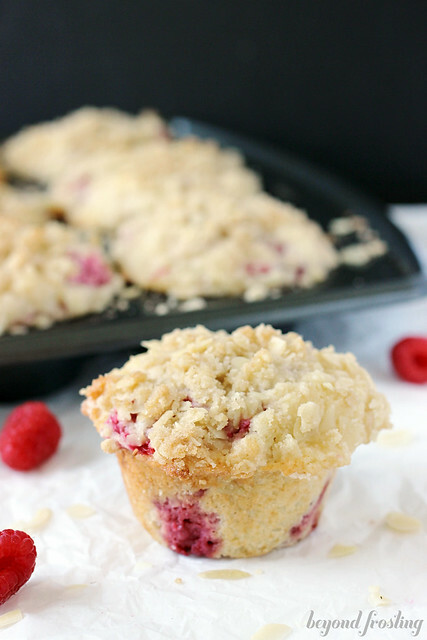 The filling is made of a cream cheese mixed with fresh raspberries and blackberries, a hint of lemon and a pinch of sugar. Well more than a pinch, but you get the picture. I followed a variation of this recipe. 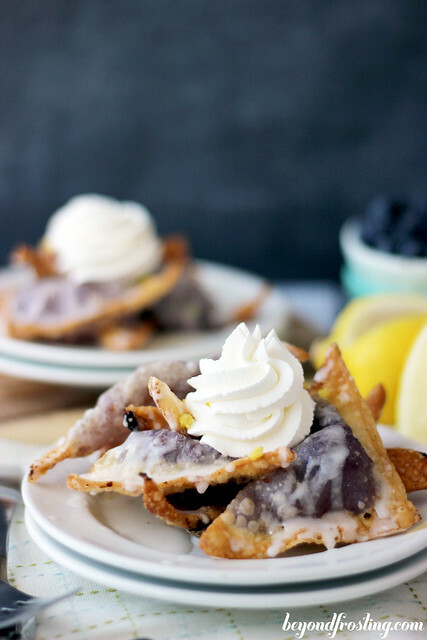 After trying these Blueberry Cheesecake Wontons, I knew I had to try a different variation. I have been wanting to make this type of dessert for quite some time. I am obsessed with cheesecake, but when I was searching for cheesecake eggrolls, I found that most desserts used pre-made cheesecake. And while this may not have the same texture as a true cheesecake, the filling still melts in your mouth. The egg rolls were quite easy to wrap, and held together nicely. Here are the steps for putting together the egg rolls, or you can just watch the video below! Fold the two sides in towards the middle creating a triangle. Brush egg wash along the top and bottom edges. Fold the bottom part of the triangle over the middle and tuck it into the filling. Now I did use a deep fryer for this, but you can easily do it over the stove. You will need a full bottle of vegetable oil (48oz), heated to about 375° F . Drop the egg rolls in with a long pair of tongs and fry each side for 30-60 seconds until it turns light brown. I chose the roll my eggrolls in a cinnamon sugar mixture, but this is optional. I also topped with egg rolls with some drizzled chocolate and homemade whipped cream. Now this might be a little over the top, but that’s just how I like to do things. 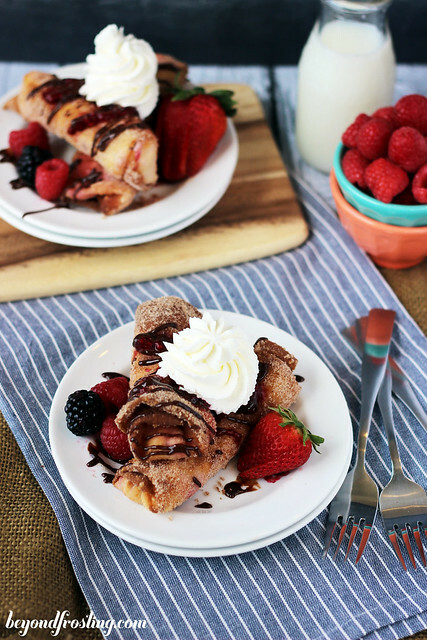 Vanilla Ice cream would also be a great addition to this dessert! This recipe makes enough for about 8 egg rolls, so if you are looking to serve a crowd, make sure you double the recipe. It is best served warm. 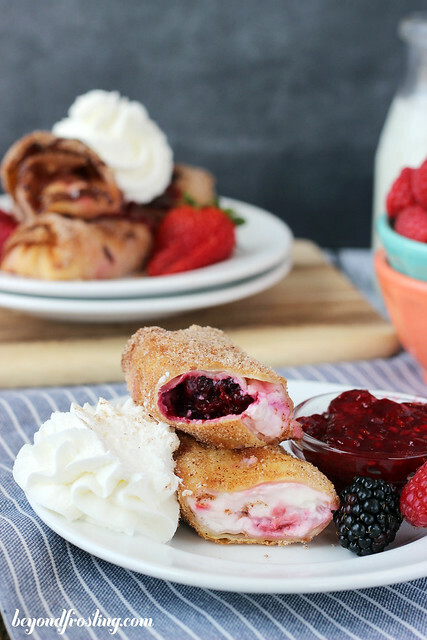 A deep fried egg roll filled with a cheesecake filling, raspberries and blackberries. Rolled in cinnamon and sugar. Use a medium sized sauce pan to heat oil to 365°F. If you have a candy thermometer, that is best, but not necessary. Preheat for at least 10 minutes on medium heat. Whenever you are deep frying, remember to use extreme caution as the oil is very hot. In a separate bowl, beat egg with a fork and set aside. In your mixing bowl, beat cream cheese and sour cream for a couple minutes until cream cheese is smooth. You may need to scrape down the bowl. Add sugar, lemon juice and lemon zest. Beat to incorporate. Scrape down sides of the bowl. 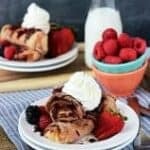 Fold berries in cream cheese mixture. Roll upwards until the other end is wrapped around the filling. Seal with additional egg wash.
Fry in pre-heated oil for 30-60 seconds per side until light brown. Remove with tongs and set egg rolls on paper towels to cool. 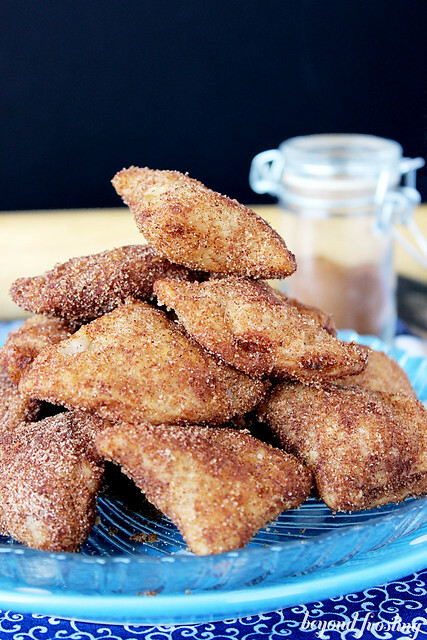 Combine sugar and cinnamon on a paper plate, roll deep fried egg rolls in cinnamon and sugar mix. To prepare the chocolate sauce, combine chocolate chips and heavy cream in a microwave-safe bowl. Microwave on high for 45-60 seconds. Stir until mixture is smooth. 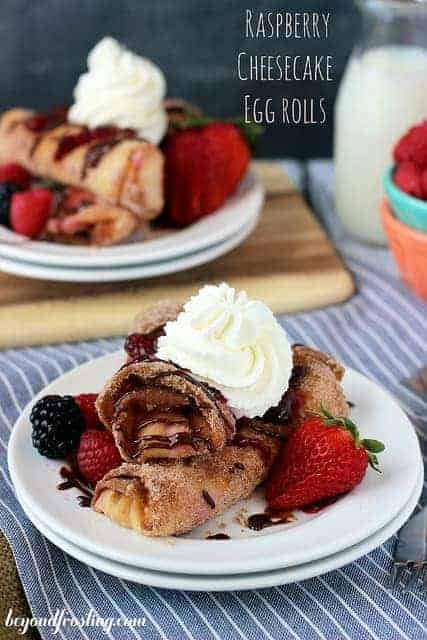 Spoon chocolate sauce onto egg rolls. For the whipped cream, combine heavy cream and powdered sugar. Beat on medium-high speed until stiff peaks form. Yum! How decadent and creative! I need these in my life Julianne! IN LOVE! Pinned girl! omg i want these! bring them to miami! yum!! I will drive to you like a mad woman if you have these in your possession right now! You should have come down on Sunday! We can totally make them again! This invention is about as genius as it can get! I want these this week!